What Has Happened to Bendish Marsh? Bendish Marsh is the name that was given to a 4 acre field on the western Greenwich Peninsula, inland from Enderby Wharf. Its name probably came from the 17th century dyke and sluice of the same name that feeds into the Thames alongside the steps and causeway at Enderby Wharf. Over the next 800 years this land was owned by various kings, queens, monasteries and noblemen. In 1698, the land was Crown property and a lease for a large part of Old Court Manor was acquired by Sir John Morden (1623-1708), from Margaret Boreman, the widow of Sir William Boreman (c.1617-1686), for £9,000. A year later, Sir John obtained the freehold of this land from the Crown. On his death, the land passed to his widow, Susan née Brand (1638-1721) and as they had no issue, on her death the land came under the control of the ‘Trustees’ of Sir John’s charity ‘Morden College’. By the terms of Sir John’s will, upon his death, seven ‘Trustees’ were to be chosen from the Levant (Turkey) Company to administer the College (and its endowed estates), and if this company should cease to exist, then they were to be selected from the East India Company. Finally, if the East India Company ceased to exist, then the Trustees should be drawn from the Court of Alderman of the City of London. This stipulation meant that there were three distinct phases of Trustee selection. From 1708 to 1826, Trustees came from the Levant Company; from 1827 to 1884, they were selected from the East India Company and, from 1885 to the present day, Trustees have been selected from the City Aldermen, many of whom have been Lord Mayor of London. In recent years only past Lord Mayors of London have been eligible for the position of Trustee. It was these Trustees who shaped the development of the land that made up part of the Old Court Manor estate. Their decisions have also influenced the way in which the Greenwich Peninsula as a whole has developed over the last 300 years. The first known map showing Old Court Manor was produced by Samuel Travers (1650-1725), Surveyor General of Crown lands, from a survey conducted in 1695 of the Crown lands in Greenwich and on the peninsula. 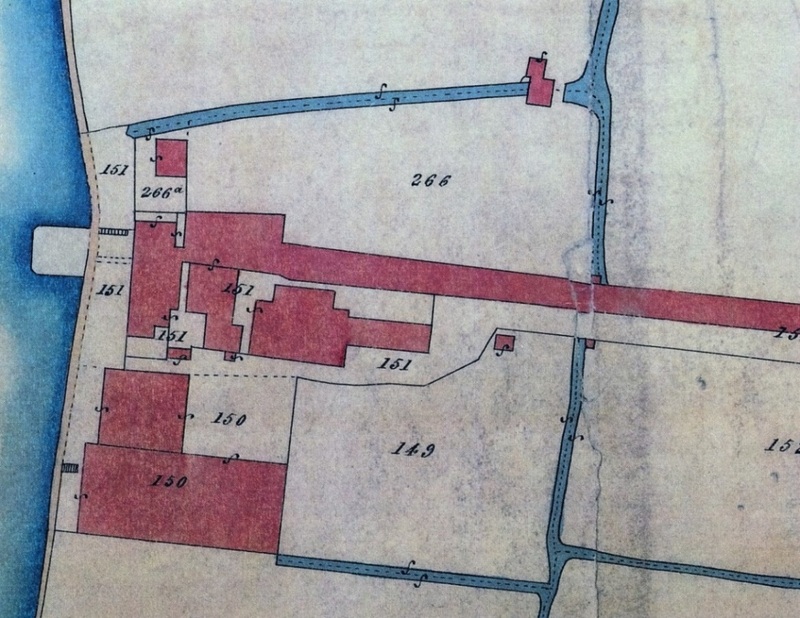 A copy of Travers’ map is held in the Morden College Archive; it shows all the Old Court Manor land as pasture and marshland, with the notable exception of the Gunpowder Magazine, which stood on Crown land, at what is now Enderby Wharf, from 1695 to 1769. This map does not give names to the fields on the peninsula. According to the Modern College’s official history published in 1982, the first detailed survey of the College lands of Old Court Manor was carried out by the Trustees in 1721. However, no record of this survey could be found in the College Archive. The first survey map, held in the College Archive, is John Holmes’ survey of 1732. This does identify the field names and Bendish Marsh is among them. 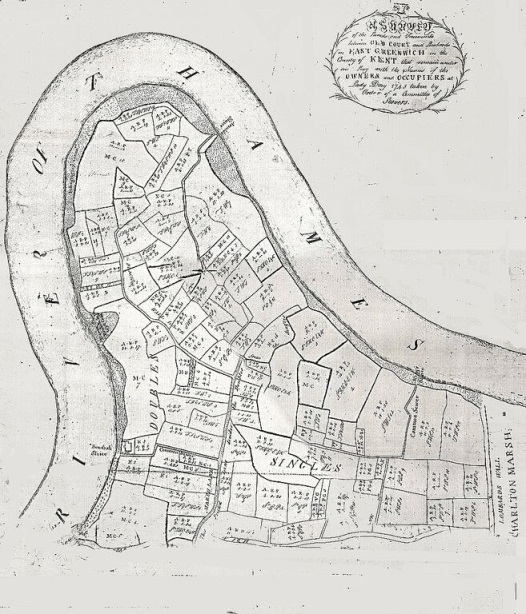 In 1960, W V Bartlett stated in his essay ‘The River and Marsh at East Greenwich’ that a plan dated 1734, described as ‘a particular of lands late of Sir William Boreman’ does still exist. It shows the layout of the fields on the peninsula with the following field names: Balsopps Marsh, Bendish Marsh, Bishiop’s Marsh, Catt’s Brains, Crabtree Croft, Dog Kennel Field, Foster’s Hole, Further Pitts, Goose Pool, Great Meadow, Great Pitts, Hawk’s Marsh, Lady Marsh, Little Pitts, Peartree Meadow, Pound Marsh, Pond Meadow, Short Bendish, The Pitts and Thistlecroft. A plan dated 1734 is not held in the College Archive. However, many of the above field names can be found in Sir William Boreman’s will. Therefore, the field name of Bendish Marsh can be traced back to at least 1686. It is probable that the name dates back even further to the early part of the 17th century when Bendish Sluice was built as part of the major drainage system introduced to the marshes at that time. 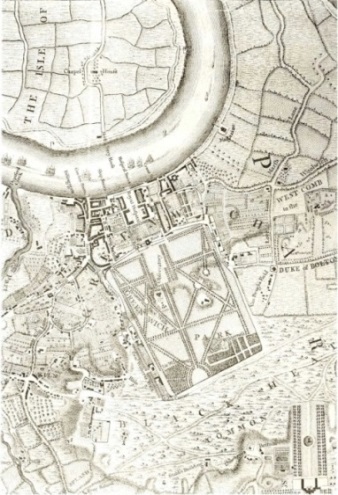 These fields, can also be seen on Timothy Skynner’s plan, commissioned by the Greenwich Court of Sewers and made in 1745, shown below. Skynner’s Plan shows the field boundaries and each plot, although not named, is given an alphanumeric reference. The Plan also denotes some areas as ‘Singles’ and others as ‘Doubles’. The field boundaries in most cases are defined by the 17th century drainage system. The annual drainage rates levied by the Court of Sewers on Doubles were twice those on Singles, e.g. in 1704, the rates were 12 shillings per acre and 6 shillings per acre respectively. The first published map showing the lands comprising Old Court Manor was made by John (Jean) Rocque (c.1709-62). He was the son of French Huguenot immigrant parents, who became a surveyor and cartographer. Rocque is best known and remembered for his detailed map of London. He began work on this in 1737 and the map was published in 24 printed sheets in 1747. 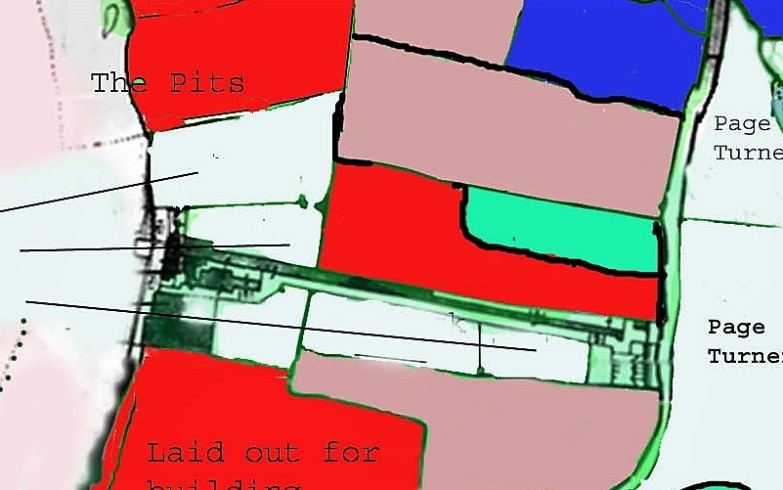 The lands comprising Old Court Manor are shown on the image above, in the top right corner, the Gunpowder Magazine can also be seen but no field names are included. In 1771, the College Trustees commissioned their surveyor, Michael Searles (1722-99), to conduct a further survey of the land on the peninsula. A map of this survey is also held in the College Archive and it identifies the field named Bendish Marsh. At the beginning of the 19th century a rope works was established on the land where the Gunpowder Magazine had stood. It is possible that Henry Vansittart (1777-1843), who purchased the land from the Crown in 1802, was the first person to permit the manufacture of hemp ropes on this site. In 1808, the rope works was in the hands of James Littlewood but he became bankrupt in 1817, and the rope works was made over to a Mr Young, who operated it until 1828. Horwood’s map of London, dated 1819, is the first to show a ‘rope walk’ on the site. The ‘rope walk’ also appears on the later Greenwood map of 1827. This ‘rope walk’ ran parallel to and just behind the line of houses that now stand on the north side of Mauritius Road. Since the 25th July 1815, Morden College had leased virtually all of its land to the north of the rope manufactory, including the field known as Bendish Marsh, to John Field, a Greenwich farmer. In 1830, the rope manufactory was purchased by Charles (1797-1876), George (1802-91) and Henry (1800-76) Enderby, collectively Messrs Enderby Brothers. Over the next few years they invested a great deal of money in developing it by adding a sail works and a hemp factory to the already existing rope-making facilities. A boiler house and steam engine were added to mechanise the ‘rope walk’ and drive looms. Until then, horses had been used to provide the power to form and lay the ropes. Over the boiler room were hemp and spinning rooms and in other factory buildings were joinery workshops and weaving looms. This facility became known as Enderby’s Hemp & Rope Works; at its peak it covered some 14 acres (5.66 hectares) and employed 250 local people. During this period, the river frontage acquired the name ‘Enderby Wharf’. The land known as Bendish Marsh was not part of this property. George Smith (1782-1869) became the surveyor for Morden College in 1838. Immediately, the Trustees instructed him to carry out a detailed survey and evaluate their land holdings on Greenwich Marsh for industrial development. Whether this initiative came about because the Trustees were then being drawn from the East India Company and policies were changing, or perhaps the idea had been stimulated by the success of the Enderby Hemp & Rope Works, combined with the less successful leasing of their own land on the peninsula to Bryan and Howden for industrial development, is unclear. Bendish Marsh would have been part of this survey but unfortunately, the maps and records of the survey could not be found in the College Archive. However, the lands that Smith surveyed are marked in Red on the 1842 Tithe Map, shown below. In 1838, the Enderby brothers acquired from Calvert Clark a small parcel of land on the riverfront to the north of their Hemp & Rope Works. This is shown on Simms’ 1838 map as 266a, as can be seen it contained a square building, area 266a is described as a ‘cottage and gardens’. In 1839, the brothers tried to lease additional adjacent lands from Morden College. This land was Bendish Marsh, to the north of the rope walk, to the east of plot 266 and the dyke shown on the Simms Map. However, obtaining a lease proved difficult, as it appears that a licence was needed from the Trustees if anything other than a bleach house was to be built on the land. As an alternative, the Enderbys offered to exchange some land already owned by them for Bendish Marsh but this apparently required Parliamentary approval, involving significant additional cost, and so negotiations broke down. This appears to confirm that at least part of the factory was rebuilt but whether it recommenced trading is less certain. Charles Enderby decided to build himself a dwelling house on the riverfront and work commenced in June 1845. He approached the Morden College Trustees again regarding the Bendish Marsh land and the minutes the Trustees’ meeting of 29th October 1845 record that it was agreed that Bendish Marsh could be leased to the Enderbys as ‘Bleaching Grounds’ but not for building. On the 13th November 1845, Charles Enderby wrote to the Trustees of Morden College offering to take Bendish Marsh on a 7 year lease. At that time Bendish Marsh comprised 4 acres, 0 roods and 11 perches. 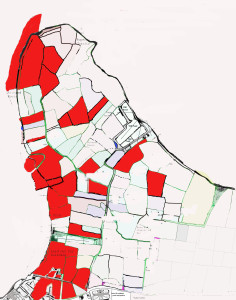 It is shown in the plan above, along with other Morden College land in Red. It is bounded to the south and west by the Enderbys land (white) and to the east by Blackwall Lane (then known as Ship and Billet Lane). The blue area is land belonging to Norfolk College and the puce land was in the hands of the Calvert Clark family. The building of Charles Enderby’s house was completed in April 1846 when Charles took up residence. He had wanted the Bendish Marsh land to provide direct access to his new residence from Ship and Billet Land, by-passing the rope works site. The lease, that was to run until Michaelmas 1854, was executed on 24th December 1846 in the names of all three brothers and shortly afterwards, it was reported to the Trustees that the Enderbys had culverted the dyke, running alongside Bendish Marsh and had built a coach road to the new house. Charles Enderby lived in the house for only three years, during which time he hosted several dinners in the ‘Octagon Room’ for representatives of the Geographic Society, of which he was a founder member, and the Royal Society, of which he had become a fellow in 1841. In August 1849, Charles Enderby set sail in the Samuel Enderby for the Auckland Islands. He would never return to the house. At that time Messrs Enderby Brothers was in major financial difficulty. George Enderby wrote to the Trustees on 29th October 1849 requesting that they take back the Bendish Marsh lease. The Trustees refused to do this but agreed to try and find an alternative lessee. In the meantime the lease was put in the hands of Messrs Lodge & Co, solicitors. No new tenants were immediately forthcoming. On the 22nd July 1854, George Smith reported to the Trustees that the Enderby lease on Bendish Marsh would expire at Michaelmas. He begged permission to find an alternative tenant and on 14th October a Mr John Smith was approved as a yearly tenant with 3 months’ notice. In August 1855, William Coles Child (1814-73) approached the Trustees about leasing Bendish Marsh. The Trustees offered him a lease with 3 months’ notice at £42 per annum. In early October, Coles Child turned down this offer as he had been unable to acquire the adjacent Enderby property at a reasonable price. On the 8th October 1855, John Smith gave notice to quit Bendish Marsh. Then on 26th January 1856, a Mr McKenzie took up a year-by-year lease on Bendish Marsh, at an annual rent of £10. This lower rent was agreed due to the fact that Mr McKenzie already leasing other lands from the College on the peninsula. When Glass, Elliot & Company purchased the Enderby property in 1857, no approach was made to the Trustees concerning the adjacent Bendish Marsh land. However, on 7th April 1864, Glass, Elliot became part of the Telegraph Construction and Maintenance Company (Telcon) and on 4th May, Telcon secured a contract for the 1865 Atlantic Telegraph cable. On the 12th May, Telcon’s solicitors wrote to the Trustees offering to take a long term lease on Bendish Marsh. The lease was finally executed on 6th April 1867. It was for 4 acres, 0 roods and 8 perches, for a term of 80 years, commencing in 1865 at a ground rent of £100 per annum. There were also a number of covenants requiring Telcon to make significant capital investment in buildings and infrastructure on the land. The area of Bendish Marsh is defined by a flooded dyke on the top half of the western side. On the northern edge to the western side it is defined by a flooded dyke for just under half the length, then by a dry ditch running south and then east to Ship and Billet Lane (Blackwall Lane). The southern edge is roughly along the line of the rope walk and associated buildings. The southern and lower western boundaries are shown on the plan by a broken line ‘- ____ – ___’. The 1907 plan of the site is very similar in this area and includes the same ‘boundary line’ denoting the southern and lower western edge of Bendish Marsh. The 1958 site plan and the 1970 plan, drawn up at the time of the STC takeover of Submarine Cables Ltd, both have this broken line ‘- ____ – ___’, showing the boundaries of the Bendish Marsh land. The Telcon lease of Bendish Marsh was due for renewal in 1945, but there are no records in the College Archive to indicate that it was renewed at any time up to the present day or that the land was sold to Telcon. However, in 2003, just prior to selling the river frontage, Alcatel-Lucent Submarine Networks (ASN), commissioned a land registry search into the ownership of the site lands. The author is grateful to ASN for allowing access to this report. The report indicates that Telcon acquired the small parcel of land owned by Norfolk College, at a time when the rest of the property was held under a single title 276267. On the 7th April 1928, Bendish Marsh and the Norfolk College land were separated from the main holding under a separate title 354883. Then, on the 16th April 1928, title 354883 was subdivided into Bendish Marsh; title TGL94231 and the Norfolk College land; title TLG12320. Why Telcon should have done this is unclear. It may have had something to do with possible sale of land due to the impact of the ‘Great Depression’ on business, or perhaps separating the land into parcels was done to align them with the different business units that would appear on the site during the 1930s. In 1935, Siemens Brothers and Telcon merged their submarine cable interests as Submarine Cables Ltd (SCL). The submarine cable manufacturing facilities of SCL were then centred on the title 276267 land. The above indicates that Telcon had possession of the freehold of Bendish Marsh prior to 1928. While no records have been found to date to show when this purchase occurred the most likely explanation is that it happened about the same time that Telcon gave up its lease on Morden Wharf. Telcon’s predecessor W Küper & Co first came to Greenwich in 1851 taking up an underlease from Charles Holcombe (1792-1870), the primary lease holder of Morden College land, at what Holcombe named Morden Wharf. In 1854, W Küper & Co became Glass, Elliot & Co and when that company secured the first Atlantic Telegraph contract it need more space, so Glass, Elliot acquired the derelict Enderby Hemp & Rope Works in 1857. For the next 38 years both sites were utilised, but according to ‘The Telcon Story’ published in 1950, Telcon gave up the lease of Morden Wharf and consolidated its manufacturing facilities on the Enderby Wharf site in 1895. 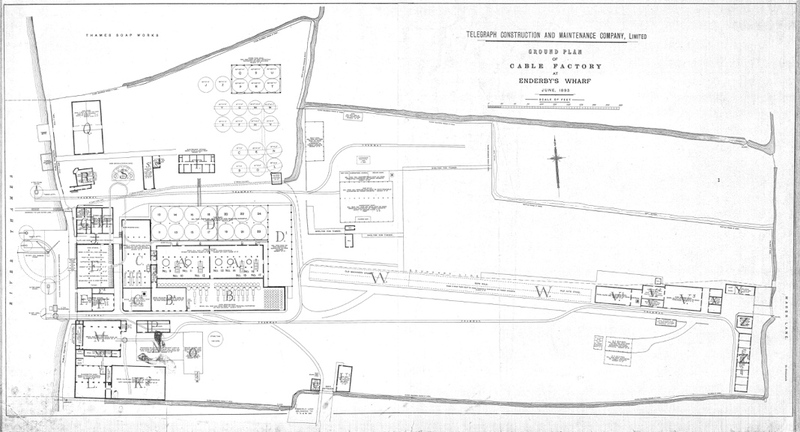 It seems likely that at that time, Telcon could have arranged to acquire from Morden College, the freehold of this 4 acres that was right in the heart of its factory site. On 28th August 1944, the plot of land on which 2 Mauritius Road stood was registered by SCL under title SGL191335. The house was demolished to widen the main gateway to the site at the end of Christchurch Way. From that date onward the numbering of the houses on the north side of Mauritius Road starts at No. 4. On 8th December 1961, the freehold of the south east corner of the main site, title 276267, was sold under title LN215230. This is the land on which the Meantime Brewery now stands. In 1970 Standard Telephones & Cables Ltd (STC) acquired SCL and on 4th June 1974, STC obtained title absolute on the four parcels of land 276267, TLG12320, TLG94231 (Bendish Marsh) and SGL191335, which made up the Enderby Wharf site. When Alcatel purchased STC Submarine Systems in 1996 these four parcels of land came under its control. From 2004 ASN began the process of consolidating and upgrading its manufacturing facilities; this process involved reducing the size of the site. In 2008, the river frontage was sold to West Properties; this included a small part of the western side of Bendish Mash. West Properties went into administration and it wasn’t until 2013 that Morgan Stanley acquired West’s assets and appointed Barratt to develop the site. This reduced ASN’s land ownership to 5 acres and in 2014 a further 2 acres were sold to the Cathedral Group (now U + I plc), this included title SGL191335, a part of Bendish Marsh and a small part of title 276267. U+I plc, in partnership with Weston Homes, is undertaking the ‘Telegraph Works’ development on this land.